Lyle: Everyone come in and find a seat, get tuned up and ready to jam! Harper: Has a strange timing... what's the time signature? Lyle: Notice the chords alternate from being hit on beat 1, then on the & of 4. Greg-PortageBay: Almost a Latin feel? Picky: I like this, gives me something to work on. 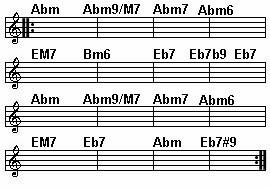 Lyle: Since the chord progression is in Abm and it's very bluesy, the Abm blues scale is a great choice of scales to use when improvising. Lyle: Here's a video clip of me just playing the Ab minor blues scale against the jam track. Notice how all the notes fit well with the background music. Lyle: Dorian works nice during the m6 chord. firsttimer: Why would you not use B Dorian over the Bm6? Is that not the chord you were talking about? Lyle: You could still use the Ab Dorian against the Bm6 chord too. firsttimer: Why did you an E major 7th arpeggio in the 5th bar? Lyle: Perhaps because of the chord being played at that time of the progression. Lyle: EMaj chord was being played during that time, and the notes from the Ab Aeolian are the same as the notes in the EMaj7 arpeggio.